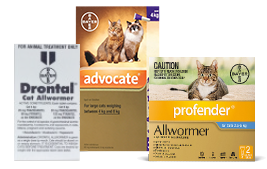 Revolution (selamectin) for Cats is a topical parasiticide for the treatment of fleas, intestinal worms, ear mites and heartworm in cats. 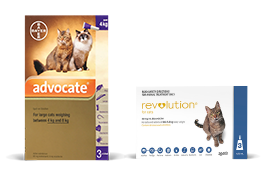 Revolution® for cats is applied to the skin on the back at the base of the cat's neck once a month. Remove the Revolution® tube from its protective package. Holding the Revolution® tube upright, firmly depress the cap to puncture the applicator seal, then remove the cap. Apply the Revolution® contents in one spot and do not massage in. The animal may be bathed or allowed to swim 2 hours after the Revolution® medication is applied. 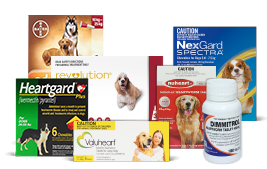 Spot on applicators are portioned based on the pet’s weight: puppies and kittens up to 5 lbs; cats between 5.1-15 lbs; dogs between 5.1-10 lbs, 10.1-20 lbs, 20.1 – 40 lbs and 40.1- 85 lbs..
Revolution® (selamectin) is generally well-tolerated by dogs. 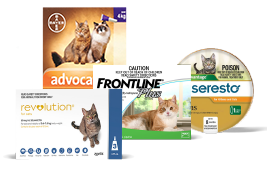 Use of Revolution® in a small percentage of cats (less than 1%) has occasionally been associated with a mild, transient hair loss at the application site. In a small proportion of these cases, transient irritation at the application site may also be observed. The hair loss and irritation are normally self-resolving, but symptomatic treatment may be applicable in some circumstances. 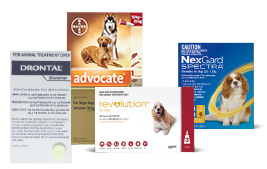 In studies, <1% of cats and dogs experienced digestive upset. Do not use selamectin in animals allergic to it. Do not use on puppies or kittens under 6 weeks of age. Use with caution in sick, weak or underweight animals. 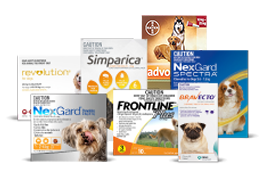 Safe for use in kittens as young as 6 weeks, breeding and nursing animals, Avermection sensitive collies and heartworm positive dogs. Flammable. Keep away from heat, sparks or open flame. This product causes eye irritation in humans and is harmful if swallowed. Avoid contact with skin. Call poison control center if swallowed. If on skin, wash with plenty of soap and water. If in eyes, flush with plenty of water.